Are you going through something right now that is requiring you to humble yourself? If so, my article in The Christian Journal this month is for you. Humbling ourselves is never that fun. It requires a decision on our part–the decision that we will follow Jesus in everything, even when it costs us something. But you know what? God is in the business of blessing us when we obey Him. If you have obeyed Him and humbled yourself, you have a reward coming your way. It’s guaranteed. 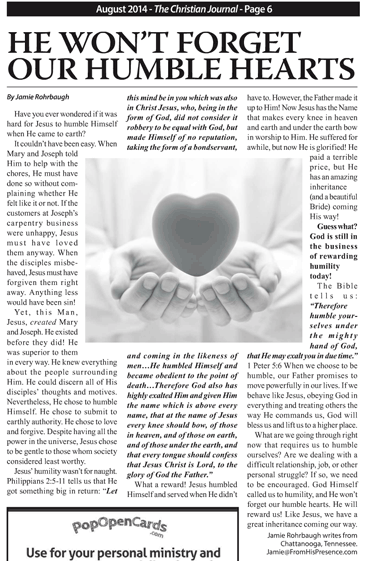 Click here to read my article, “He Won’t Forget Our Humble Hearts,” on page 6 of August edition of The Christian Journal!